This chapter focuses on specialist homelessness services funded by government under the Council of Australian Governments (COAG) National Affordable Housing Agreement (NAHA) and National Partnership Agreement on Homelessness (NPAH). Other non-specialist homelessness services are not included in this Report. In 2016-17, the Australian and State and Territory government recurrent expenditure on specialist homelessness services was $817.4 million. Most of this expenditure (95.9 per cent) was funding provided to agencies to deliver services for people who are homeless or at risk of homelessness. Nationally in 2016-17, an estimated 288 273 people were provided support by specialist homelessness agencies. Specialist homelessness agencies provide a number of services to clients — across a range of support areas — including general services (provided to 89.6 per cent of clients), accommodation (29.9 per cent), assistance to sustain housing (27.0 per cent), and domestic and family violence services (25.2 per cent). are of high quality, provided by qualified staff in a safe environment. Governments aim for specialist homelessness services to meet these objectives in an equitable and efficient manner. 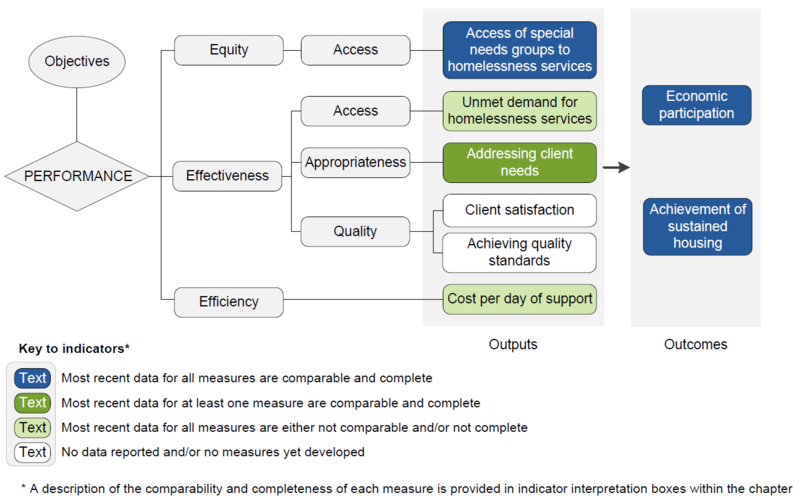 The performance indicator framework provides information on equity, efficiency and effectiveness, and distinguishes the outputs and outcomes of homelessness services. The performance indicator framework shows which data are complete and comparable in the 2018 Report. An overview of the Homelessness services performance indicator results are presented. Information to assist the interpretation of these data can be found in the indicator interpretation boxes in the Homelessness services chapter and attachment tables. These data and caveats for these data are available in chapter 19 and attachment 19A.